MSU is trying to defend their title in a March competition, but it’s not for a sport, it’s for card making. 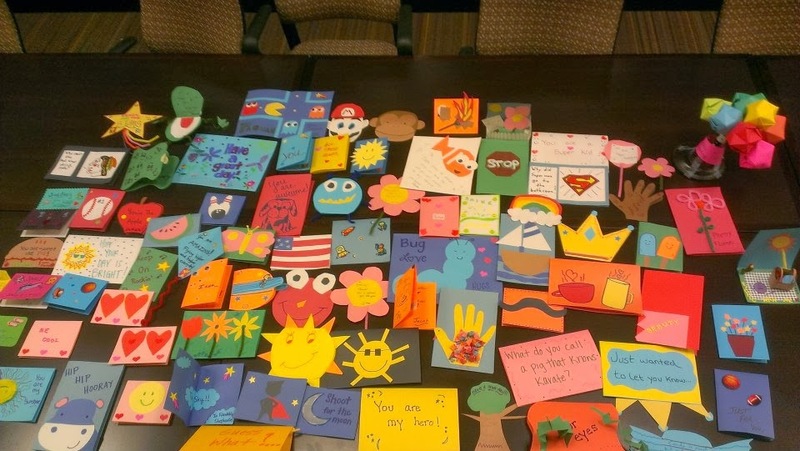 The competition, called “March Gladness,” is hosted by an organization called Cardz for Kidz, a nonprofit with a goal to get as many handmade cards as possible sent to terminally ill children in hospitals all around the world. The competition began March 1 and ends March 31. The competitors are any and all universities across the nation and the competition is scored simply by which university creates and delivers the most cards. Last year, in its first year of competition, MSU won the competition by creating 571 cards, all of which went to Shriners Hospitals for Children in St. Louis, Mo. Karen Anderson, Director of Community Engagement at MSU, hopes MSU can defend its title, but says another school may be looking to pull off the upset. “We have heard rumors that a school in Wisconsin [is] attempting to challenge us,” she said. In an effort to make a big push for card creation, the Community Engagement Office (CEO), set up a competition for RSO’s. The competition is ongoing and interested groups are asked to reach out to the CEO to get a supply kit to make cards. The three RSO’s that make the most cards will receive a cash prize. The deadline for submitting created cards is March 25 at 4 p.m. More information on the competition can be found on Engage. Anderson hopes the internal competition can help MSU win the national competition. She’s also hoping the international students can use their diverse backgrounds to contribute to the competition and create extra special cards. “One of the very special things about MSU is that we have a so many international students, and with that comes the ability to write cards in many different languages,” she said. Cards in different languages and ones that had significant effort go in to making them have profound impacts on the kids who receive them. MSU has been a partner with Cardz for Kidz for a few years and is the only university in the country to be recognized as a “Platinum” partner. MSU achieved this status by having created more than 1,000 cards since the beginning of the partnership. For more information on Cards for Kidz, visit their website cardzforkidz.org. For more information on the card competition, contact the Community Engagement Office or visit Engage. Specialty Healthcare is returning to MSU for its ninth consecutive year. Student Union from noon to 10 p.m. and will include free food, bowling, karaoke, dancing, a live DJ, jazzercise, a performance by the MSU Dance Team, a caricature artist, cosmic bingo and more. Local families and children impacted by Gillette will be in attendance at the event, something many participants look forward to every year. the city of Mankato to gather funds. The unity that MAVATHON brings to campus is something Ryan McCormick, Morale Director for the event, said is vital to its success. Dance Marathon. The group works year-round to plan the event and fundraise money, all of which is donated locally to Gillette Children’s in Mankato. 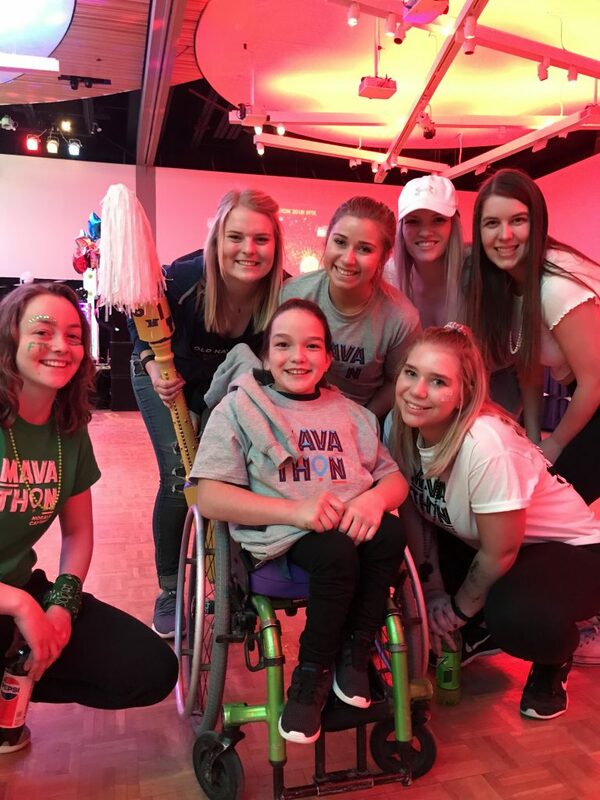 This is the ninth year the event has taken place at MSU and over the course of those nine years, MAVATHON, which is Minnesota largest dance marathon, has raised more than $100,000 for Gillette — more than any other Minnesota dance marathon. and charitable care to local hospitals. MSU student-led, MAVATHON, is offering a day of free haircuts to support children in need. The event, called Clips for Kids, will offer free haircuts by Campus Coiffures. Donations will be accepted for the haircuts as well and all proceeds benefit Gillette Children’s Specialty Healthcare in Mankato (a donation of $10 is encouraged, but not required and any dollar amount helps). “It received good feedback last year and a lot of the people in the community look forward to the event, so we thought we’d continue it and make it event that happens every year,” Anna Sunderman, Graduate Advisor for MAVATHON, said. In addition to students and community members having the ability to donate to Gillette, they can also donate their hair. 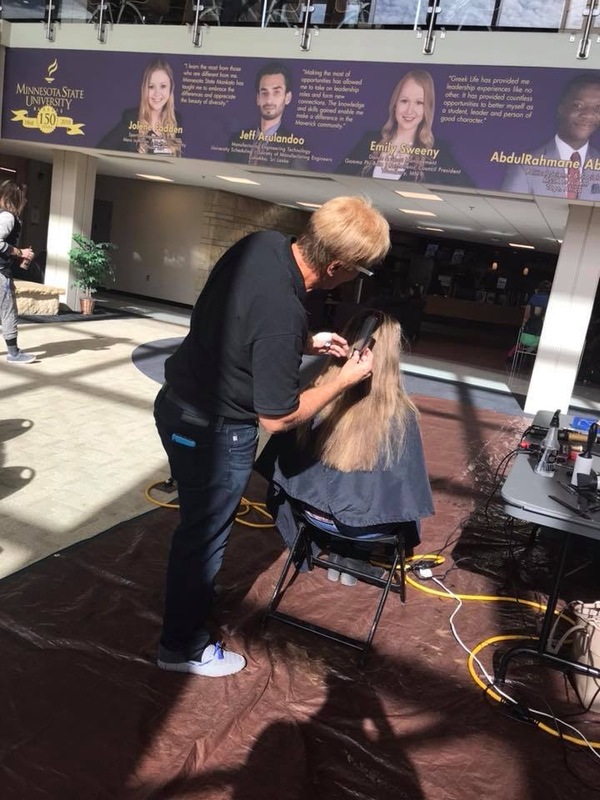 Greg Wilkins, Associate Director of the CSU and Student Activities, is encouraging students to donate 8 inches of their hair or more to give to an organization called Children With Hair Loss, which creates free wigs for kids who have lost their hair. It can take over 50 inches of hair to make a wig, so every chop of 8 inches is a big help! Campus Coiffures stylist, Ken Bunde, giving a haircut at least year’s Clips for Kids event. The fundraiser is a part of MAVATHON, a student-led group in charge of coordinating MSU’s Dance Marathon, a nationally renowned organization that hosts events on college and high school campuses to raise money for the Children’s Miracle Network. This will be the second year Campus Coiffures has offered to help with fundraising efforts. “This is an event the [executive] board is really excited about,” Sunderman said. The event is slated to take place Tuesday, Feb. 12, from 10 a.m. to 2 p.m. in the CSU Hearth Lounge. Students who aren’t able to make it to Clips for Kids, but still want to donate to MAVATHON can do so by making a donation to the MAVATHON Donor Drive. MAVATHON’s campus-wide fundraising celebration event is set to take place Saturday, Feb. 23, from noon to 10 p.m. in the CSU. Students looking to participate in that event can sign up to join a team by visiting the registration page. Any further questions about Clips for Kids or for MAVATHON can be directed to Anna Sunderman at anna.sunderman@mnsu.edu. You can also find out more information about MAVATHON by checking out this week’s Serendipitous Moments video. We will work on several community service projects. Projects are open for anyone to join in to complete. Minors should be accompanied by adults. We will collect money to pay for lunches and milk breaks for ISD77 kids when their parents forget/are unable to pay for it. We will collect new or gently used kid-friendly college jerseys/t-shirts from MSU, Mankato or other colleges/universities, to share with ISD77 kids who need clothes. Shirts should be clean and in good shape. If you have questions, contact the Community Engagement Office at 507-389-5789. Lincoln Lounge – 6:30 p.m. to 8 p.m.
Bullpen – 7:30 p.m. to 11 p.m.
Ostrander Auditorium – 7 p.m. & 9:30 p.m.
Bresnan Arena – 5:30 p.m.
Verizon Center – 7:07 p.m.
Bresnan Arena – 7:30 p.m.
Bresnan Arena – 3:30 p.m.
CSU MavAve 1 p.m to 4 p.m.
CSU Ballroom – 5:30 p.m. The Chili Cook Off, which took place Thursday, Nov. 8, was a huge success for the MSU Community Engagement Office and The Campus Kitchen. The event, which benefited The Campus Kitchen, featured four chilis, including a smoky Texas-style chili, a white chicken chili, a sweet and spicy chili featuring a cinnamon roll and a completely vegan chili, all of which could be sampled by the campus community for just $2 or a food donation. The vegan chili, created by MSU Campus Dietitian, Lexi Cournoyer, was voted as the top chili of the competition. 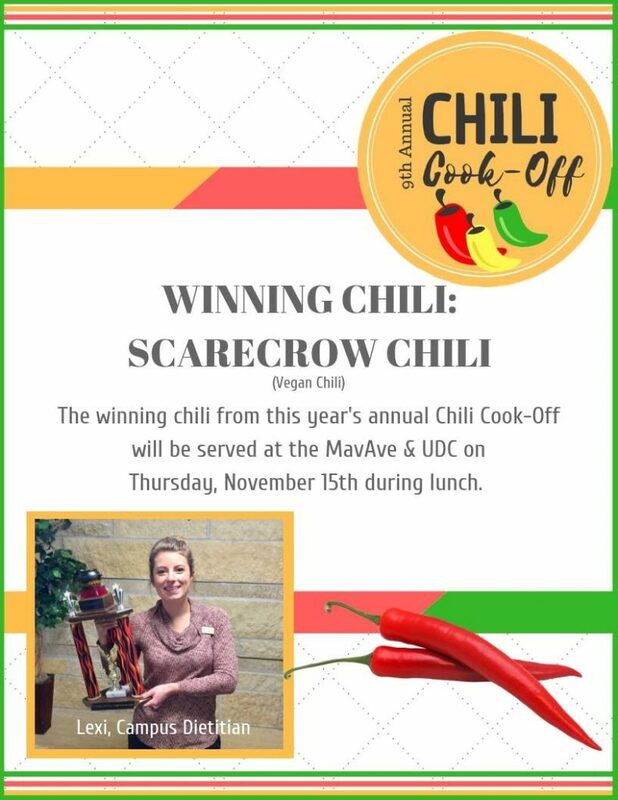 Her chili will be served in the University Dining Center and on Mav Ave Thursday, Nov. 15 during lunch. In all 486 food items and over $100 in cash were collected. The donations benefited The Campus Kitchen and will continue to help provide meals to students every Monday between 6 and 6:30 p.m. Those meals are distributed by the Community Engagement (CEO), who offer several resources for students struggling with hunger and food insecurities through partnerships with the University, Crossroads Ministries, Echo Food Shelf, Salvation Army, Centenary Church, Food Not Bombs and others. The Community Engagement Office is working on ways to further their reach to help more students by implementing a text program, which notifies subscribers when The Campus Kitchen has food available and when the CEO is hosting an event. Students can get those updates by texting SUPPORT to 76626. The CEO is also seeking help with promotion and research development through the work of an intern. Interested students can apply and learn more through Handshake. Starting back in 2015, the Community Engagement Office created the Maverick Holiday Carnival. 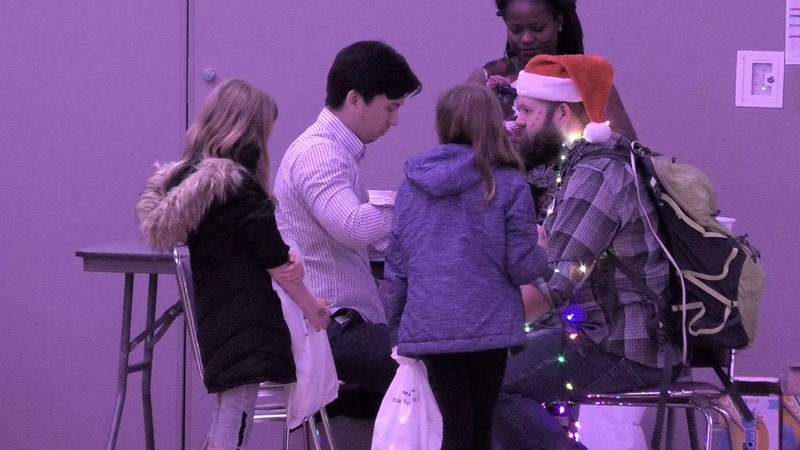 An event that offered an opportunity for college students, holiday fans and organizations to interact with children and families in the Mankato area. Those interested in hosting a fun event, will create booths with activities/games for elementary students in the Mankato area and their families. Elementary students will attend,play games and win prizes at each booth, which will consist of carnival games for children up to 12 years old. “The theme this year is Candyland Holiday Carnival, so we plan to incorporate lots of Candyland themed decorations as well as holiday decorations,” said Kennedi Alstead, Community Engagement Office, Graduate Advisor. The Maverick Holiday Carnival will take place on December 9th in the Centennial Student Union, Ballroom from 1:30 p.m.-3:30 p.m. However, organizations that are having an activity will have access to the ballroom starting at 11 a.m. and should be ready to go by 1:15 p.m. The actual event will take from 1:30-3:30 p.m. for the actual event and no later than 5 p.m. to take down. The Community Engagement Office is looking for organizations, chapters, offices, and departments to host a booth for their event. Mavs in Action will pay for $50 of supplies for each group that participates. Groups that sign up before November 16th, will have the privilege of Mavs in Action getting the supplies for their game for them. The form will include, supplies needed and a description of their activity. If groups want to be a part but do not have an idea for an activity, we have many ideas available to offer. The sign-up form will be available on engage for groups to sign up until the end of November. But those who sign up after November 16th will be in charge of getting their own supplies. “Additionally, there will be a competition where kids can vote on their favorite booth! The winning group will receive a special prize,” said Alstead. Organizations interested in being a part of this fun tradition can apply here and contact kennedi.alstead@mnsu.edu for more information. Do you want the opportunity of volunteering and serving the community while traveling to another state? Their programs include: Early Childhood Center, After School Program, Summer Camp, Kingdom Academy Teen Program, Financial Stability Services, Health & Wellness, Maternal Mental Health for Latinas, Social Capital Building and Senior Programs. If you are interested and would like to make a positive impact in a community by working with children and those in need then, make sure to check them out HERE. If you came to Minnesota State seeking the ultimate college experience, everything you’re looking for may be right in front of you. The Ultimate College Experience is the marketing campaign the MSU fraternity and sorority community has embraced for the past three years. The idea came about when previous fraternity and sorority leaders wanted to rebrand the community. They thought about the community’s values of friendship, scholarship, service and leadership and decided that those four things combined created the “ultimate college experience” for their members. “It’s called the Ultimate College Experience for a reason. If you think about every aspect of college that would make it memorable, fraternity and sorority life covers it all,” Kevin Hines, the Interfraternity Council (IFC) Vice President of Recruitment said. 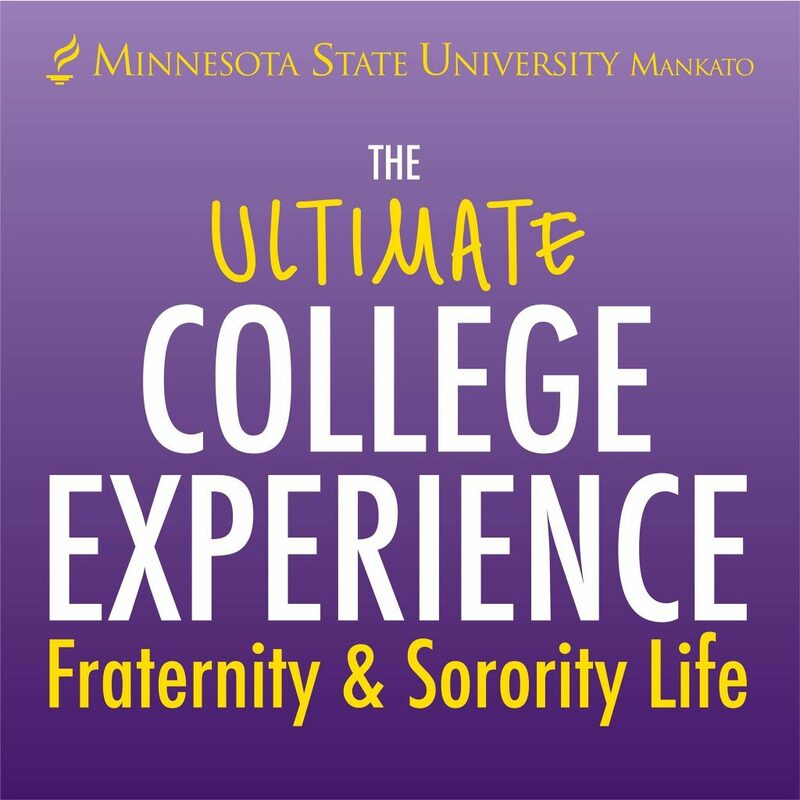 Each of MSU’s fraternities and sororities have been hard at work recruiting motivated individuals who are seeking their ultimate college experience. They’ve already hosted several campus events including the Backyard Bash and Cosmic Bingo where they’ve met and interacted with prospective members. Hines said there’s nothing to worry about when considering joining a fraternity or sorority and that it’s okay to take a leap of faith and go through recruitment. Lexi Stauffacher, the Panhellenic Council (PHC) Vice President of Recruitment, also encourages those on the fence with recruitment to give it a try. “Even if you’re unsure about joining fraternity & sorority life you should give it a try because you have nothing to lose but everything to gain,” she said. The two offered great insight into how fraternity and sorority life has given them the ultimate college experience. Hines reflected on the ability to recognize people everywhere he goes. Stauffacher said being in a sorority helped her grow individually and helped her build connections. Hines also touched on how the fraternities and sororities at MSU are trying to shift the conversations and stereotypes surrounding Greek organizations from negative to positive. Fraternity recruitment begins Thursday, Sept. 20 and runs through Sunday, Sept. 23. If you have interest in signing up, you can register by visiting https://www.mnsu.edu/activities/greek/prospective/fraternities.html. Any questions can be directed to Kevin Hines at Kevin.Hines@mnsu.edu. What Does ‘House of Serendipity’ Mean? How important is a student union to a student’s overall college experience? At the Centennial Student Union at Minnesota State University, Mankato, validating our campus presence through a random student survey is something we do every couple of years. It provides valuable information and a reality check against what we say we do and what students generally and actually think of us. And the survey says…our 2018 overall results graphically indicate that we are steadily advancing our overall effectiveness. Students further shared that, in 2018, we are ahead of the curve when compared to six national student unions of comparable size and services, reputable “Carnegie Class” institutions as well as all institutions completing surveys in 2018. Student opinions show overall progressive growth in effectiveness of Centennial Student Union services and programs. A comprehensive view of the Centennial Student Union shows satisfaction higher than comparative universities across the country. We can pat ourselves on the back, but we know there’s no resting on our laurels when it comes to our own expectations and, more importantly, our students’ expectations. As student union administrators, we know that college is more than classrooms and textbooks. So much of learning is accomplished outside the classroom – personally, socially and globally. We know that a strong student union presence plays a pivotal role in student success and growth. We know that a student union is more than brick and mortar. To help students, we know that a student union must be a living, evolving culture. It’s pulse must be the pulse of the campus. Back in 2010, the CSU set out to define that culture by branding itself the “House of Serendipity.” The moniker seeking a place for unexpected discoveries – pleasant surprises – was taken from the words of the late C. Shaw Smith. Along with being a student union director and the former president of the Association of College Unions International, Smith was an accomplished magician. That may have accounted for his philosophy that a quality student union should be a surprising, life-changing experience. “I like to call the Union the House of Serendipity,” Smith said. “You go for one thing and you get more than you bargained for. It’s inescapable. It gets into your head and into your heart, and you’re never quite the same again. The right Union will change you.” His words have become the mantra behind the mission and vision of the CSU. Providing our students with a Serendipity experience started with our tagline “offering pleasant surprises ’round every corner.” That literal application morphed a few years later into a philosophical message that helped express the vision of the CSU. Now “offering pleasant surprises that INVITE, INVOLVE and INSPIRE,” the CSU views those three words as a Maslow-style progression of personal growth. We seek to create an inviting environment where students can find the creature comforts – food, essential services, corners for studying or sleep and, most importantly, social interaction. Once achieved, that level of comfortability encourages student to get involved. Coming into the CSU could lead to joining a fraternity or sorority, getting involved in student government, writing for the student newspaper or helping to plan homecoming, concerts or campus activities benefitting all students. Such personal engagement inspires students to spread their wings as they explore and achieve personal confidence and leadership skills that will shape their careers and adult lives. Along this journey of personal growth, students are supported by the CSU’s core values that seek to engage students along six prime objectives – Leadership, Integrity, Community, Personal Development, Innovation and Celebration. So how does this all get back to the original question: How important is a student union to a students’ overall college experience? Retention is such a key focus for Minnesota State Mankato as it is for universities across the country. At the heart of that discussion is the ability for a university to meet a student’s needs and expectations. As the student-centered heart of campus, the CSU sees the student union’s important role in adding broad-based value to the college experience. Sometimes to the surprise of our students. Recently, the Washington Post offered a perspective from Jim Troha, a private college president who was also the parent of a prospective college student. The article – entitled VALUE MATTERS IN CHOOSING A COLLEGE. BUT NOT JUST THE PRICE KIND – shared Troha’s view of higher education from a different angle. Too often, college administrators size up value along yardsticks that measure scholarships, job-placement rates, graduate school enrollments and students’ marketable skills. By looking past price to value based on the culture of a university campus – in our case, a university student union – Troha said parents and students are better equipped to ask deeper questions. “They realize potential, networks and the long game (so to speak) are of equal if not greater importance than the immediate details of cost comparisons,” he stated. At Minnesota State Mankato, the goal is for each of us to visualize “Big ideas. Real-world thinking” in every one our students. The Centennial Student Union works to accept that calling by striving to offer a culture of value that pleasantly surprises students into realizing their full potential. Their big idea may be Serendipity of Self where global thinking is shaped through personal experiences that apply leadership, integrity, community, personal development, innovation and celebration. For the CSU, helping students equip themselves with those shared tools will maintain the student union’s important role in a valued and enduring college education.